UND Assistant Professor of Biomedical Sciences Archana Dhasarathy explains her work with epigenetics at a recent forum that delved into “Discovery,” one of three pillars in UND’s draft Strategic Plan. Photo by Jackie Lorentz. Eight months of discussion. Forty-five campus representatives. No fewer than 22 team meetings. And now, one penultimate draft of UND’s Strategic Plan. During the April 19 budget forum, UND Provost Tom DiLorenzo introduced Strategic Planning Committee co-chair Dana Harsell, who presented a brief overview of the much-anticipated blueprint for guiding UND into the role of the Premiere Flagship University of the Northern Plains. 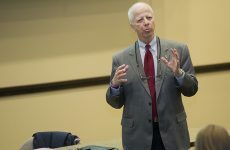 “We’ve created a plan that has virtually all of the elements that committee members were looking for in one way, shape or form,” Harsell told the group gathered in Education Building Room 7. Now, the committee is looking for help with prioritizing the action steps, communicating the plan and executing it. Harsell said one of the biggest complaints about most strategic plans is they’re not acted on, but UND’s plan will include metrics, timelines and implementation teams to account for progress. “A strategic plan alone doesn’t implement itself. 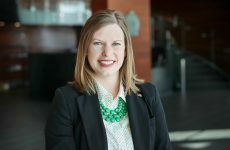 So we’ll be looking for campus leaders who have expertise in certain areas to help with the implementation side,” Harsell explained. An online survey has been opened to allow the UND community to review the Strategic Plan’s goals and action steps and help prioritize them, as well as offer ways to best disseminate and carry out the plan. That survey will remain open until April 30. Once feedback is assessed and worked into the final strategy, a formal rollout will be held on May 5 in Memorial Union Ballroom from 2:30-3:30 p.m. Fine-tuning will continue over the summer as the individual colleges and divisions work to align their strategic plans into the larger process. 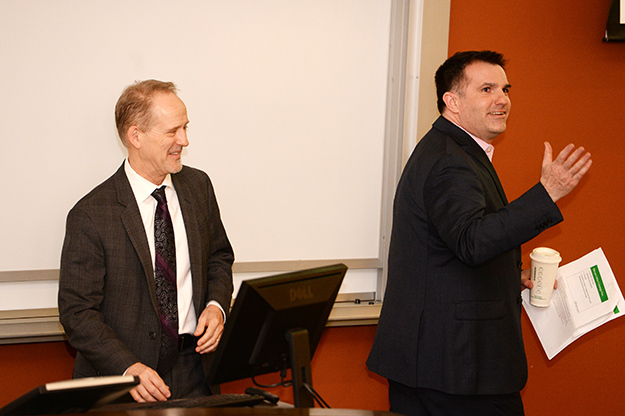 UND Vice President for Research & Economic Development Grant McGimpsey (left) leads a discussion on UND’s draft Strategic Plan with Dana Harsell, Strategic Planning Committee co-chair, at a recent campus forum. McGimpsey addresses UND’s goal of generating opportunity for North Dakota by “diversifying its economy and addressing societal grand challenges through cutting-edge research.” Photo by Jackie Lorentz. Harsell quickly turned the forum over to UND Vice President for Research and Economic Development Grant McGimpsey to lead a deep-dive discussion on the Discovery pillar of the three-pillar plan. “Discovery, research, scholarship and creative activities are integral to what we do as a University. They’re one of the two cornerstones to the University, the other being instruction,” McGimpsey said. McGimpsey explained that UND is currently an R2 institution according to the Carnegie ranking system of research universities. The Discovery pillar’s ultimate goal is advancing UND to a level consistent with Carnegie level R1, but he clarified that the ranking itself is not the goal—rather, it’s an attainable metric showing improvement. UND can grasp an R1 ranking by boosting research funding, both externally and internally, he added. The Strategic Planning Committee will be working with departments across campus to designate champions for each Grand Challenge area. The champions will assemble faculty and staff teams to help them define and drive research goals for each challenge. “The Grand Challenges are great ways for the University and the faculty to think about how their research can fit into a broader picture,” McGimpsey said. In support of the Grand Challenge areas, the Strategic Plan states that UND must recruit and retain star research faculty, increase the number of non-faculty post-doctoral researchers, and identify high-potential research-based Ph.D. programs. Other action items of the Discovery pillar include accurately capturing faculty time devoted to research, and deciding, at the departmental and college level, on reasonable expectations and recording systems for research, scholarship and creative activity. The final action step is investing in high performance computing, cybersecurity and data analytics. “These investments are not going to help only a computer scientist. They’re going to help someone in English who’s working with digital humanities. They’re going to help people across all disciplines, because we’re all dealing with data in one way or another,” McGimpsey said. McGimpsey gave some floor time to faculty who have found support for their research through UND seed funding awards. One of those opportunities, the Post-doctoral Award Program, provides funding to hire a post-doctoral associate for two years. 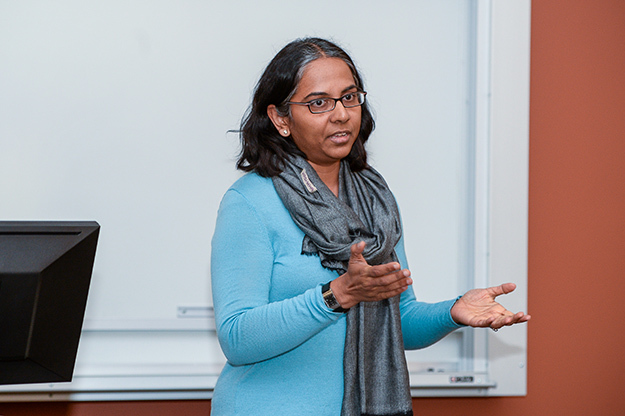 Award recipient and Assistant Professor for Biomedical Sciences Archana Dhasarathy explained her work with epigenetics and how it translates to progress in managing diseases like cancer. She said the post-doc assistance freed up her time to work on grants. 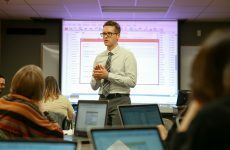 Another internal funding program, the Early Career Award, provides up to $20,000 to help new tenure-track faculty begin to build a tenure case. Assistant Professor of English Sheila Liming used her Early Career Award to spend a month in Massachusetts developing a digital interface for the library collections of author Edith Wharton. That work drew media coverage that led to a call from a publisher interested in seeing her manuscript. “The Early Career Award has launched me in multiple directions from this project and has engineered a lot of really wonderful opportunities for me,” Liming said. Internal funding is also available through the Research Equipment Award Program and Research Infrastructure Award Program. McGimpsey said faculty can reach out to his office for more information. 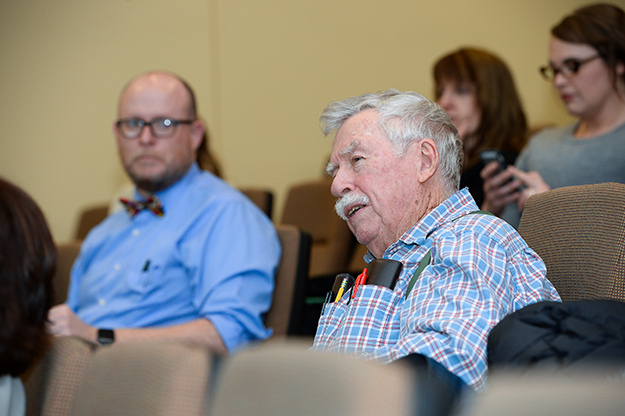 UND Professor of Biology Bill Sheridan, one of many staff and faculty who attended a recent forum focused on research under the draft UND Strategic Plan, questioned whether faculty tasked to champion components of a new Grand Challenges initiative would also be expected to take on full teaching loads and other duties. Photo by Jackie Lorentz. In the final minutes of the forum, Professor of Biology Bill Sheridan raised a question about proposed champions for the Grand Challenges. “Do you suspect these being regular full-time faculty? If so, if they’re going to do things like assemble faculty and staff and motivate and meet, are they also going to have full teaching loads and committee assignments?” he asked. Dexter Perkins, UND professor of geology, inquired, “If we’re going to be putting more focus on research activities, what aren’t we going to be doing? That time has to come from somewhere,” he said. A link to the Discovery pillar presentation can be found at the UND Office of the Provost website. The budget fora will continue with information on UND’s Strategic Plan pillars of Learning and Engagement on Wednesday, April 26 from 3-4:30 p.m. in Education Building Room 7. Extra time will be allotted this week for an extended discussion of the Strategic Plan.